Case Study | Tamoda Apparel, inc. The following story was published by our customer: Kitsbow, and can be found here. As you step inside Tamoda Apparel Manufacture in Vancouver, BC, it’s hard to not feel as though you’ve just slipped behind the curtain of a very private atelier. Tamoda is a very small, intimate company, and the acute sense of voyeurism felt while carrying a camera around their production floors could not be ignored — like bringing a camera to the dinner table at a friend’s house. But despite a size that belies its outward appearance, Tamoda offers a highly specialized degree of personal attention and a wealth of experience in outdoor apparel manufacture to smaller labels looking to bring the very most to their various spheres. It’s clear that Tamoda prides itself in getting every stitch or seam weld right every time before getting the product out the door, and it’s this dedication to attention and consistency that makes Tamoda a perfect fit for Kitsbow. raised a number of now well-established labels, like Arc’teryx, lululemon and Sugoi, along with many others. All told, Tamoda itself currently produces for over 20 brands of varying size and scale, from major players in the outdoor industry to smaller, boutique apparel labels just like ours. However, rather than focus on growing its client portfolio, Tamoda insists on maintaining its own niche as a facility that prides itself in developing close, and mutually beneficial relationships with small, up-and-coming brands. In turn, we get unprecedented access to production processes, fast prototype turnarounds, and a highly personalized attention to our needs that simply could not be done anywhere else. This contradiction flies in the face of most manufacturing conventions which insist on outsourcing to create larger contracts with greater minimums and lower manufacturing overhead. And as we’ve already discussed , you know this is simply not how we’ve chosen to do business. 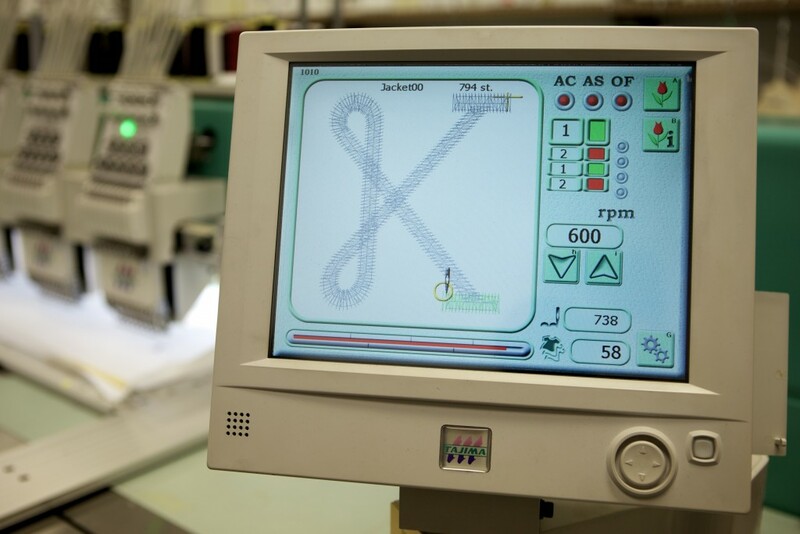 …right down to the careful embroidery of our logo hits on the shoulder and sleeve of the jacket — another fascinating automated process that meticulously covers nearly 800 stitches in only a few short moments. Tamoda sees plenty of Swiss Schoeller fabric come through its doors and onto its machines. Here, we see a roll of the wind and water resistant Schoeller USP (“Ultralight Soft Protection”) fabric used in the shoulders of our Mixed Shell. Speaking of Schoeller, the Mixed Shell Jacket is constructed from a combination of two of the Swiss textile maker’s fabrics to maximize breathability and water resistance in places where you’ll needs them most. Thankfully, Tamoda allowed us a chance to test that water resistance under circumstances that didn’t necessitate a long ride in the rain. From having crafted for some of the most trusted names in the outdoor industry to working with smaller, design-centric boutique outerwear labels, the sewing machines at Tamoda are rich with experience. One can’t help but think of all the incredible fabrics that have passed through these needles and gone on to tackle the most epic trails and highest summits in the world. We feel quite privileged to have the level of access that we do at every step of the design and production process — one more benefit to having our collection produced in the same time zone, and just a short flight away from Marin.